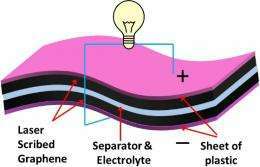 (PhysOrg.com) -- Electrochemical capacitors (ECs), also known as supercapacitors or ultracapacitors, differ from regular capacitors that you would find in your TV or computer in that they store substantially higher amounts of charges. They have garnered attention as energy storage devices as they charge and discharge faster than batteries, yet they are still limited by low energy densities, only a fraction of the energy density of batteries. An EC that combines the power performance of capacitors with the high energy density of batteries would represent a significant advance in energy storage technology. This requires new electrodes that not only maintain high conductivity but also provide higher and more accessible surface area than conventional ECs that use activated carbon electrodes. Now researchers at UCLA have used a standard LightScribe DVD optical drive to produce such electrodes. The electrodes are composed of an expanded network of graphene  a one-atom-thick layer of graphitic carbon  that shows excellent mechanical and electrical properties as well as exceptionally high surface area. The process is based on coating a DVD disc with a film of graphite oxide that is then laser treated inside a LightScribe DVD drive to produce graphene electrodes. Typically, the performance of energy storage devices is evaluated by two main figures, the energy density and power density. Suppose we are using the device to run an electric car  the energy density tells us how far the car can go a single charge whereas the power density tells us how fast the car can go. Here, devices made with Laser Scribed Graphene (LSG) electrodes exhibit ultrahigh energy density values in different electrolytes while maintaining the high power density and excellent cycle stability of ECs. Moreover, these ECs maintain excellent electrochemical attributes under high mechanical stress and thus hold promise for high power, flexible electronics. WOW...OUTSTANDINGLY high conductivity numbers...now if I can just locate some ESR numbers for it, I can start building a new kind of 'switching' (or, new class of operation for switching) power supplies. How many farads? How many KWH/kg? Could somebody look at the actual study to determine how this new EC stands up to the latest electric car battery? Don't be too quick to get your hopes up. Supercapacitors have other drawbacks, like fast self-discharge (i.e. you can't park your car without having to recharge it before you want to travel again). If they get that one solved, however, then it would be a big step forward. Parking is where you plug the car in! Not a dealbreaker. A driver(a computer chip that controls the power, not a car driver) could predict when a super capacitor discharges and take advantage of it to use that power to supply a battery or the grid. And charging will take a while. Supercapacitors CAN charge in a short time. However a normal outlet cannot deliver that amount of juice in a short while. If you want to take advantage of the quick charging times you'll have to go to dedicated stations. For automotive use, this would be used for regenerative braking and acceleration. They'd be sized to store enough energy to go from a standing start to top speed, and maybe a little more to offset lost performance due to aging phenomena. About 100kW for 6 seconds should do. Regular secondary batteries are for overcoming friction losses, wind resistance, etc. These still have to handle a full day's worth of duty, but because the supercaps take over the high-current requirement, the batteries can be lighter and longer lived: they only need to deliver the steady-state current needed for highway speeds and recharging. Whether the right mix is 80/20 or not depends on detailled performance characteristics. Or....have a stand-by power pack ready to drop in at the house or, also....a charge station that uses the same power-pack/supercap arrangement. Now, cost to performance,divided by longevity would be the issue. Should make a great bomb once they figure out how to stack gazillions of layers into a compact volume. Hummm...maybe, not a bomb, but, a much more compact trigger. If I can manage the power flux yield at the nanomaterial level, I could build a pulse rifle, featuring square casings, no CASELESS, in the 10 to 20 millimeter range, explosively formed rounds -from the Supercap's ignitor, using preformed metal slugs, protect the barrel with a mag field and ablative inserts (graphene? ), pushed out at better than 6000 meters per second would make them inherently armour piercing. Enhance accuracy by ionizing the rounds flight path with a pulse of free electron laser fire. Facilitate effective fire by pushing out at least 20 rounds a second limited to three-second burst. Manage recoil using an opposing mag field, just enough to do the job (Have to raise my bench press a bit!) I might need a Man-Magnifier suit -Vendi, get on that w/camouflage! OHH! Biggy...armour-protect the weapon!! "If you want to take advantage of the quick charging times you'll have to go to dedicated stations." Oh NO!! You mean I might have to drive somewhere other than my house to add more energy to my car??? NEVER!!! I don't think the inventor of this thing has even measured how much capacity it has, other than sticking a LED to it and seeing that it shines. So...lemme get this straight: you get rid of the expensive battery in the car to buy supercapacitors and a LARGER expensive battery set at home...Makes sense. Oh no, wait...it doesn't. Oh NO!! You mean I might have to drive somewhere other than my house to add more energy to my car??? NEVER!!! Remember: you park at home. The cap discharges over night. How are you going to get to the station? Lay down 20km of heavy duty cable? No, the battery/SuperCap modules, are well placed, as now.... You 'trade' them! Something like recycling and leasing combined. Instead of pulling up to the pump and paying for gas, you pull up...drop your discharged module - trade. It's tested for lifespan..you pay LESS when your module is new...you pay more, as the module becomes antiquated and more difficult to charge. Not that different from the burden of running an older car as opposed to newer tech. Gas stations are not inside a friends house/beach/school... (U have friends or...oh well) charge stations can B anywhere. How will you 'pull up' when you CANNOT GET THERE because your supercap discharged over night or while you were inside the mall power-shopping or at your in-laws in the sticks or...anywhere where you didn't park RIGHT NEXT TO A SWAPPING POINT? OKAY, it was plugged in all night, and somehow...YOU probably would ride it into the ground and drain every last drop of juice out of it and get on Physorg and cry about it...I get it now..OKAY you win...Most people run out of gas rarely, and know how to read the gas gauge...and I assumed you do too. My bad..You should stick with gasoline forever...just ignore all this tech stuff that leaves you in the middle of a Kansas cornfield without a spare drop of, or hope of getting to, a charge station...I see your point, none of this could possibly work for you...good luck...stick to those liquid dinosaurs until you become one of them. It won't work for you...ok, ok, ok! Most people don't expect to park their car with a full tank and come back a few hours later to discover it's empty. THAT is the problem with (super)capacitors. This has nothing to do with not being able to read a fuel gauge. It doesn't matter what your fuel gauge says. You will not be able to top up your car sufficiently to ensure that you can start it the next time you want to use it. I love this tech, but it's not for use in EVs as the main energy storage solution UNLESS they figure this problem out. There are uses in brake energy recuperation and quick acceleration boosting as SongDog already pointed out. A. The self discharge rate was not disclosed; it varies dramatically for cap technology type. Most ultra-caps are only a bit faster than lead-acid batteries, and stored energy of an organic electrolyte supercap decreases to 50 percent in 30 to 40 days. My golf car more than tops itself off every day with sunshine. No plug needed for maintenance. B. I wouldn't take any vehicle on a trip where there is not a known refueling opportunity within range (others aren't so stringent). When I learned to drive cars did not have an idiot light for low fuel; it is a telling example that it appears all new cars do. Modern gas cars have fuel tanks sized to the average area density of modern gas stations and average driver habits. 100 years ago drivers on longer trips often bought gasoline in pharmacies. The future will have a different infrastructure for different fuel. Guys, you can't remotely extrapolate other EC characteristics (e.g. self discharge) to these devices. Supercaps vary from each other tremendously in every way. These will probably have some other drawbacks, but you have no idea which ones yet and you certainly have no idea if self discharge is one of them. If leakage is an issue, it will affect more than just not being able to park away from a recharging station. Imagine the energy required to balance the leakage rate. Imagine a nation/world full of cars with super-vampire rechargers continually topping off these capacitors as they sit in their owners' garages. All that energy being dissipated as waste. What if this technology could be integrated into solar cells produced with the twin creeks method of hydrogen exfoliation of silicon? I could see some brilliant, cheap solar cells with integrated power storage. Anyone see any drawbacks to such a system? I'm thinking cheap and effective. How much would leakage be a factor in such a system? Anyone see any drawbacks to such a system? - Production vs. storage density. - Different lifetimes of the two systems (i.e. you have to throw it away when the less long-lived one gives out). Apart from that I'm not entirely sure what you would want to gain from combining these two systems? I was just thinking of possible integrated storage for solar cells. If there was a way for units to store the energy they produce integrated into a solar cell, I think it would make implementation much more desirable.